← Now That Its Winter, Should I Pull My Listing Off The Market? The 2014 gun deer season opener in Hayward has come and quietly gone without much to report. This year was a buck-only season and as of the third day, I don’t think many bucks were taken from the Hayward area in northern Wisconsin. I had almost everything ready the night before. When the Saturday morning alarm screeched out, I thought there was something wrong, why, its the middle of the night still, surely I set it for the wrong time. Darn! it really is 4:45 am. Coffee and hot chocolate for each thermos and away we go to our deer stands. 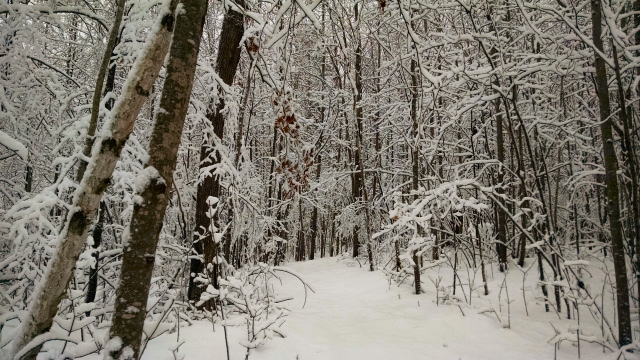 The nightime forest was eerily quiet as we trudged through the slushy snow to our stands. The early morning was very dark and my trail through the woods appeared as a black hole. My gear and supplies for the day got heavier and heavier with each hill, and I wondered why I brought so much with. Finally everything is up in the stand, organized, and I am ready for opener. Nothing to do now but sit and wait for daylight. As the night gradually gave way to the morning light, my excitement grew. I imagined a big buck among the trees, materializing with each passing minute of the rising sun. Well, that never happened, if he was there, he was smart enough to move on before I could see him. The fresh morning light revealed a barren woods as far as I could see. So the morning crept on with me scanning the woods and hillsides for any sign of those nocturnal bucks I’d seen on trail cam, hoping they’d forget, just for once, to hide during daylight. By all accounts, it was a warmer day than usual, but the dampness in the air chilled me right down to my bones, that is, until we fired up my savior, Mr. Heater. 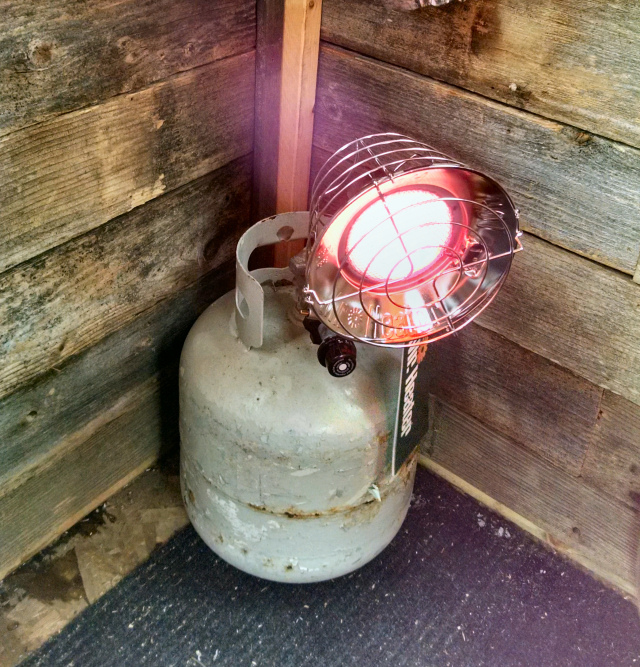 The hot chocolate and propane heater made for an almost balmy hunt that first day! A little buck meandered in right after lunch. He slowly picked his way through the woods, past my tree stand and up the hill to the next food plot. I didn’t want to shoot him – he had one tall spike with a bit of a fork starting on the end, and his other horn was shorter. This young guy needs more time on this earth. A few minutes later, two does cautiously approached the food plot. After scrutinizing my tree stand, they deemed the area safe and began digging at the greens under the snow and munching a bit of corn. Suddenly, up on the high ridge, I could see more deer coming this way! The heavy bramble of tree trunks and branches concealed the deer well; I couldn’t see them clear enough to tell what they were, but there was a large-bodied deer trailing the group and I hoped it would turn out to be a buck. Unbelievably, just at that very moment, the heavy layer of snow on the metal roof of the tree stand decided to let loose. The loud ‘whoosh’ as it slid from the roof, and the even louder thud it made when it hit ground was enough to send the does and the incoming group running for cover, and they never ventured back. That was it for opening day of gun season from my tree stand in Hayward. I never saw another deer the rest of the day. It was fairly quiet all around – I heard probably a half-dozen shots early in the morning and only a very few late afternoon. The next day’s weather put a damper on my hunting – the temperatures rose throughout the night which created a dense cover of fog which persistently lasted from daybreak through to dark. This fog was thick and relentless – I could not see more than probably 10-20 yards into the woods at any given time. Throughout the day, the wind would move the fog around from one area to another, opening up the view for a brief time before the next cloud moved in. For the most part though, I couldn’t see much, and for all I know, a whole herd of bucks could of been right out in front of me, probably laughing! The third day’s weather proved just as challenging; an overnight snowstorm blew in and covered everything with a crystal white blanket. 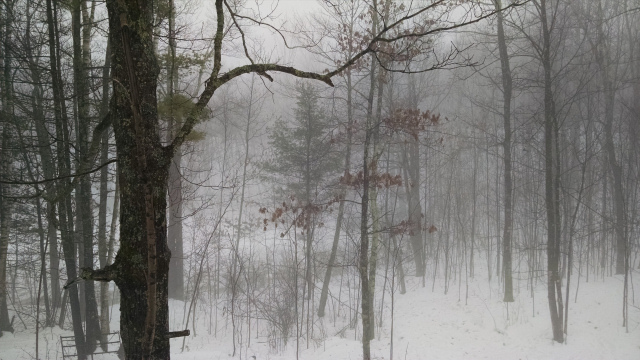 The tree branches, damp from yesterday’s dew, became ice-encrusted and created a post-card view of the woods. Although breathtaking, these white flocked trees again squashed my ability to see much beyond the food plot below my stand, and the bitter west wind that accompanied this storm made for an all-around nasty day. I only saw one doe that entire third day – and she must of been hungry because we looked right at each other several times, and she chose to ignore me so she could pick at the corn buried under the snow. Perhaps I looked too cold to do any harm anyway. So now, I’ve driven back home for the Thanksgiving holiday, but plan to finish out the final weekend hunting back in the Hayward area. Happy Thanksgiving to all of you! And good luck hunters! This entry was posted in Hunting, NORTHWOODS LIFE, Scenic Observations and tagged 2014 gun deer season northern wi, cathy lareau realtor, deer hunting hayward wi, gun hunting hayward wi, gun season hayward wi, snowstorms in hayward wi, weather in hayward wi, women hunters. Bookmark the permalink.